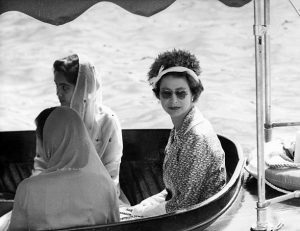 54 years back, Her Royal Majesty, visited India just after independence in January 1961. She alongside Prince Philip landed at the Delhi airport and was greeted by the Indian President Mr. Rajendra Prasad and Premier Pandit Nehru. After her visit to Delhi, Jaipur and, Agra, she visited the Maharani of Udaipur. In Udaipur, The Queen of England was introduced to the members of Darbar who were dressed in traditional Rajasthani Paridhan including jewelry and iconic Safa Pagdi. The Queen and Duke also visited Shiv Niwas, the water palace. A video coverage of the Queen’s visit to India was documented by British Pathé. In olden times, people used to rely on theaters for all the news of the world. British Pathé is considered as “one of the finest newsreel archives” in the world. It has a genuine collection of over 85,000 newsreel of historical and cultural importance. The British Pathé YouTube channel consists of some bizarre, delightful and historical events from all around the world. From Fashion shows to war documentaries and from deaths of prominent personalities to some of the greatest inventions, it contains everything to keep you hooked. You might also come across some things first of their kind in their collection of documentaries. The documentary featuring Queen’s visit is in three parts in which you can see how beautifully India and its monuments are captured. In the Reel- 2 of the documentary, Udaipur is featured and one can very well see how journalists, from all over the world, gathered in order to capture every moment. Moreover, local people can be seen in large numbers, sitting and waiting to catch one glimpse of the Queen. Furthermore, while reading this, you might be wondering about the big, white statue of “The Queen” currently placed in The Saraswati Library, Gulab Bagh, so FYI, the statue is of Queen Victoria. She was entitled Empress of India on 1 May 1876. Queen Elizabeth II is Great-Great Granddaughter of Queen Victoria. The statue was removed immediately after Independence when a riot took place. It was then replaced by the statue of Gandhi Ji.